The smell of fresh rosemary, thyme and sage-marinated turkey roasting in the oven and homemade pies helps some, but nothing is quite like being in the U.S. for Thanksgiving. It’s something that is irreplacable and unduplicatable. Unlike Christmas, Thanksgiving is NOT only celebrated anywhere except primarily in North America (in the States and Canada – a Canadian reader just informed me) – contrary to some beliefs. 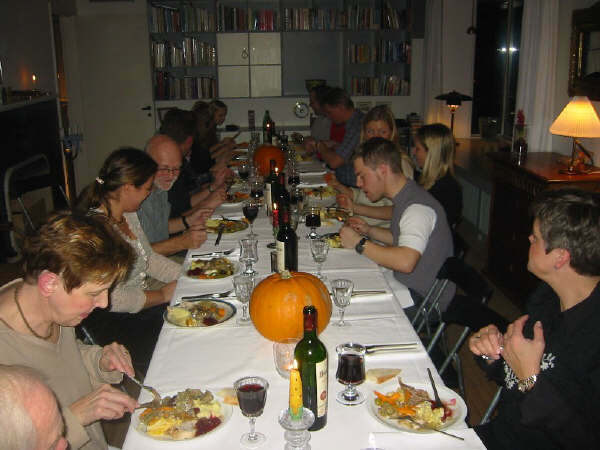 Yes, it’s true, I have had some people say, “you mean they don’t celebrate Thanksgiving in Denmark?”. It is usually part of the same conversation that also includes, “they don’t have Wal-Mart or Target either?”. “They” don’t have a lot of things that “they” do in the U.S. oh like 295 million more people for example, and with a completely different history, geographical location, culture and oh yeah, language it’s not really fair to compare now is it? 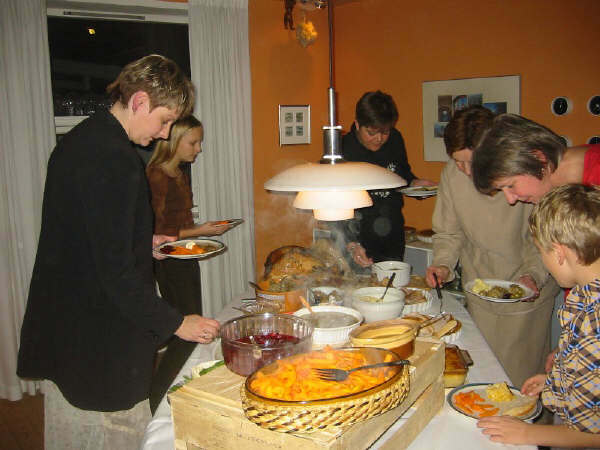 My first year in Denmark we held a huge Thanksgiving dinner at my Danish in-laws. We invited about 25 people. I felt that it was my mission to introduce this American holiday to my Danish family so that they could come to appreciate it as I do. I even gave a speech and wore my hair like a pilgrim. It was such a big affair that we quickly realized that it wasn’t feasible to do this every year on our own, so we scaled back the next year. Year two we went from over 25 people to about 15, and then the third year down to 10. 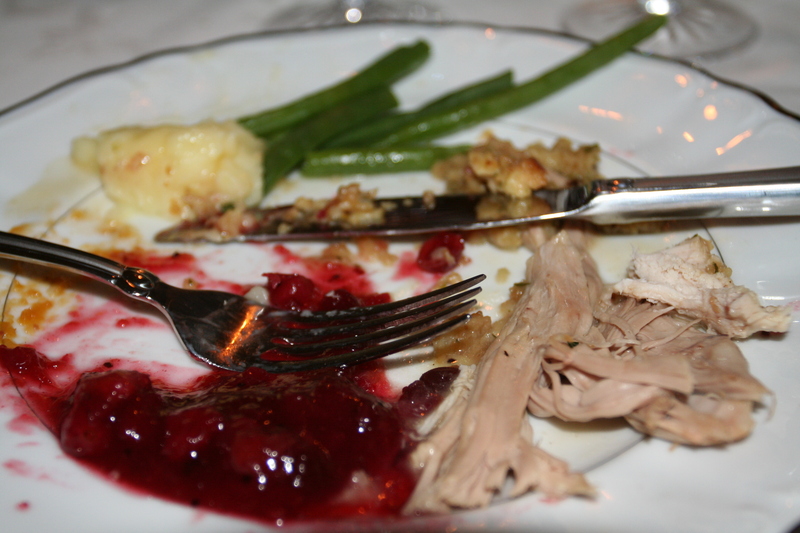 Our fourth year, we skipped cooking at home altogether and opted for the Thanksgiving buffet at the Marriott. It was very disappointing and we declared never to do that again! Year five, I was lucky enough to be home in the U.S. and celebrate in Texas. Last year we celebrated with a small group of friends (reducing even further to six), and also attended the American Chamber of Commerce’s annual family Thanksgiving dinner at the Marriott. Yeah, we went back but only after having our own, much better version of course! This year, it’s just L&L. In fact, we didn’t even decide to cook until Sunday night so it was a little last minute. I guess I can say that over the years my need to share this very American celebration with a foreign land has reduced significantly. What hasn’t is my programmed sentimental side that always gets activated on this day. I suppose it’s because it’s been ingrained in me since I was a child. The main activity of Thankgiving that I miss the most isn’t the eating or the napping or even watching the football game. It isn’t looking forward to going to the mall the next day (the famous “black Friday” or biggest shopping day of the year) kicking off the Christmas shopping season. It’s watching and listneing to the Macy’s Thanksgiving Day Parade in the morning. It’s like Christmas but instead of opening presents, you watch some of America’s most talented dancers, musicians, singers, performers, etc. There’s just something about a big band, twirlers, floating Snoopy and Sponge Bob Square Pants that pull at my heart strings. And don’t forget Santa closing the virtual parade curtain. Thanks to this wonderful invention called the Internet, I can watch some of it and listen to all that happy glory while waiting for turkey. It’s soon done now so I will enjoy as much as I can and infultrate the feeling of Thanksgiving in our humble home — far away from the home of Thanksgiving. Happy Thanksgiving to all those other Expats out there! Enjoy it as best you can. We have Thanksgiving in Canada…in October. Really? I had no idea! Wow, that’s fantastic. Do you make the same kinds of foods? I’ll have to look this one up! As American ex pats in Vancouver B.C., we totally missed Canadian Thanksgiving the first year because we weren’t expecting it until November! We had our Thanksgiving dinner at the Spaghetti Factory that year! I don’t celebrate Thanksgiving or any holidays…but I like Christmas. I think Canadians eat similar food that are shown in your picture.